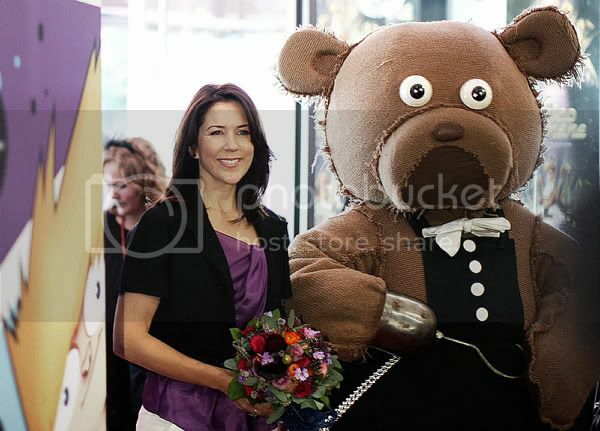 Crown Princess Mary attended the gala opening of BUSTER 2008 - the Copenhagen International Film Festival for Children and Youth - as its patron on Friday (September 19). Mary was greeted by the DR bear Bruno and the popular young Danish X-Factor star Martin Hedegaard. Martin sang at the opening and also had a song included on the soundtrack of the opening animated film Disco Ormene. There is a strong tradition of making children's and youth films in Scandinavian countries. BUSTER - Copenhagen International Film Festival for Children and Youth was founded in 1999. During the last five years it has grown to become Scanidinavia's biggest children's and youth film festival, celebrating Nordic films and films from all over the world. 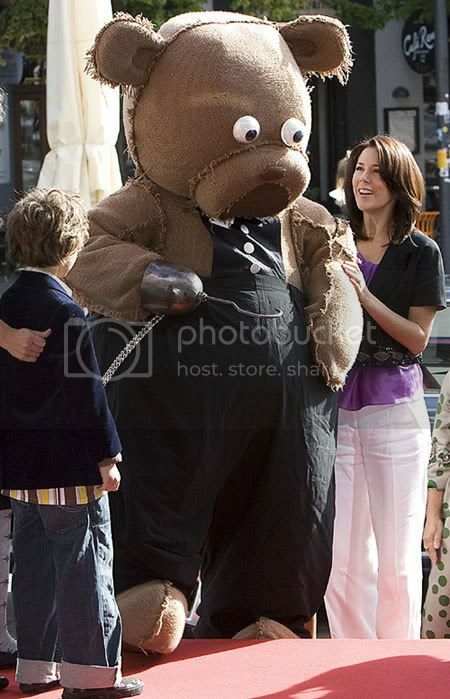 It wasn't a Crown Prince Frederik whom a smiling Crown Princess Mary had a hold of, when she arrived at the international film festival for children, "Buster 2008" at the Palace Cinema in Copenhagen - no, it was [Bruno] the Bear. Today Crown Princess Mary opened the festival where she also managed to see X-Factor winner Martin, who also got the opportunity to greet the Crown Princess. The film festival will end on September 26th. B.T. 'X-Factor Martin vild med Mary' - about X-Factor's Martin Hedegaard being a little nervous in anticipation of singing for Crown Princess Mary and info for readers about the festival. Teddy bears are irresistable at the best of times, but this one is unbelievably so! How did Princess Mary resist the temptation to take him home I wonder. By the way Lotte, did you notice that when she was in Bulgaria Princess Mary was wearing a shortened version of a beautiful dress that she wore in a shoot for Australian Vogue shortly after she was married. Highly commendable I'd say, and it still looked as glamorous on her. it's very great that events like this exist,I don't know very much about this event.Is there some website where I can know much more? anyway I want to say thanks for all the post about the danish royal family because I love them very much!